Joy Creek Photo Archive (c) all rights reserved Our specimen of Spiraea thunbergii 'Ogon' fills up the central position between a dark green Pinus 'Thundercloud' and the intense gold barring of the stiff Miscanthus sinensis 'Strictus'. Small willowy golden leaves shimmer on arching stems. 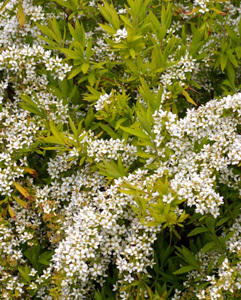 The small white flowers in spring create an airy effect. A Great Plant Picks Selection. Spring. 3.5 ft. x 6 ft.